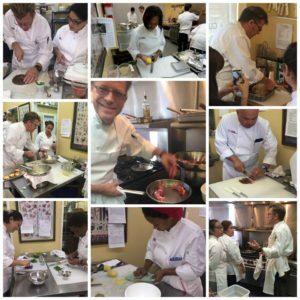 If you are passionate about cooking, ready to boost your confidence in the kitchen, or thinking about a career as a professional chef, you came to the right place. Chef Eric created this program for you! Our 14-Week Professional Master Chef Program will teach you all you know to succeed in today’s restaurant environment. This French-based system is a comprehensive cooking program designed to teach in individual modules that build from Knife Skills, to Sauces, to Vegetables, to Meats and Fish, to full Meals. Recipe Development and Costing are key components of this program. We offer career guidance/internships for those who are ready to embrace their passion and pursue a life in the culinary arts. We have students working for Wolfgang Puck at Spago, at Hinoki and the Bird, Neiman Marcus, Mélisse, Osteria Mozza, BLD Restaurant, the Waldorf Astoria, as Chef’s and Pastry Chef’s in the finest restaurants across the world, as Personal Chef’s in homes everywhere, as Caterers, owners of their own businesses, at the mom and pop cafe’s down the street – many times as owners! Where do you want to be? 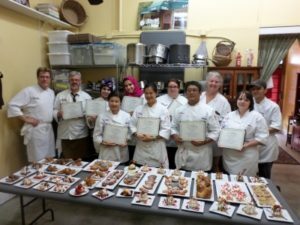 If you’re passionate about baking, ready to boost your confidence in the kitchen, or thinking about a career as a professional baker or pastry chef, you’ve come to the right place! Chef Eric created this Baking Program for you! Our 10-Week Professional Master Baking Program will teach you what you need to know to succeed in today’s professional environment. We have students working for Wolfgang Puck at Spago, as Pastry Chef’s in France, in the finest restaurants across the U.S. – and the mom and pop bakeries down the street – many times as owners! Where do you want to be?